I first notice the peach on the railing before we leave for the movies. I don’t ask my grandmother about it because she’s not in the room and I think about taking a picture, but even I realize this is only funny to me. Obviously she put it out there to ripen in the sun, even if this still strikes me as funny and a little reckless. Like putting a pie on the sill to cool and leaving for vacation. The next morning the peach isn’t there but I don’t notice right away. I go outside to drink coffee and soak in the peace and cool of early morning. Right away, I realize it is not quiet and it is hot and I’m not sure where to sit. I remember her mentioning one (or more) chairs being broken and wish I’d asked which one (or ones). None of the chairs look particularly broken. They all have overstuffed and obviously not original cushions and I flashback to the one garage sale we had growing up where my parents sold an easy chair that was missing the elastic straps underneath the cushion. I guess the straps broke at some point and my dad, being relatively handy, cut a square board to fit against the frame, thus supporting the cushion and anyone’s backside who plopped down, devil may care. Well for reasons not known to me now, though my parents were always thrifty and practical and may have thought up some need for that exact sized square of plywood, they removed the board and hauled the chair out to the yard to sell. Now if you were going to pay $10 (I’m just guessing, I don’t actually remember how much we asked) for a chair, wouldn’t you want to sit on it first? Test it out? Of course you would. I remember a nice woman came along. I’m picturing her now with dark, possibly permed and close cropped hair and a barrel purse of light tan resting midpoint between her armpit and waist. She eyed up the chair shyly and then backed up carefully like one would into a parking spot but then lowered herself a bit too eagerly, certainly for anyone over 40 pounds onto an unsupported cushion base. The chair cushion swallowed her up and her arms were suddenly waving helplessly like an overturned bug, her legs rendered useless by the unfortunate angle and gravity. The barrel purse only wedged her in tighter. I of course ran off to find my brother and tell him the good news but was laughing too hard to explain and lost precious time. By the time we got back, the woman was gone and the chair still there, silently waiting, cushion back in place for the next potential customer. This morning I pick the chair closest to the door and sit tentatively, gingerly, and I’m sorry to report nothing bad happens. It is not the broken chair. 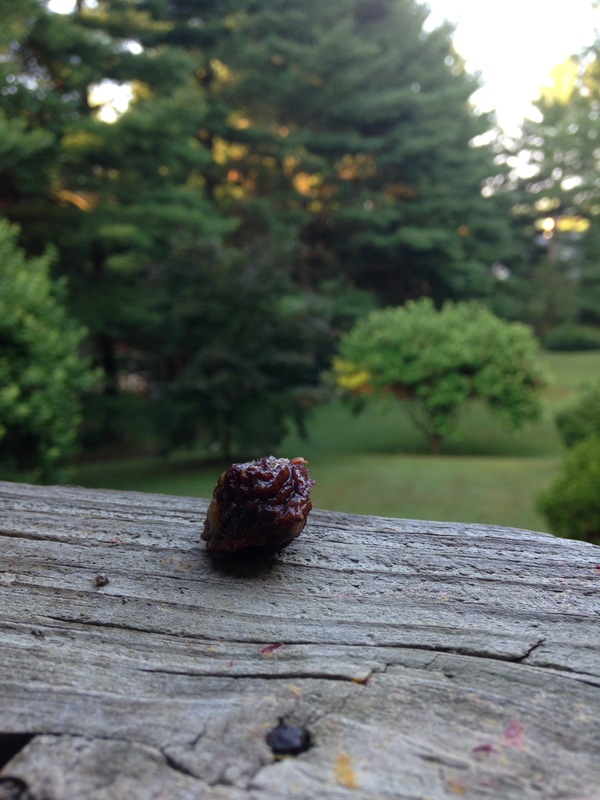 I drink coffee and listen to a family of crows argue and wish I’d brought my journal or something to read, but if I had my eyes might not have fixed on the peach pit sitting on the railing in front of me. Wait, was that where the peach was last night? Wasn’t it down about two feet, to the right? Yes, I’m pretty sure of that because it was centered through the picture window in her kitchen. If I was going to put a peach out to sun ripen, that would be the best spot to keep an eye on it. Upon closer inspection, there are faint peach slime trails traversing about two feet from the center origination point and the pit itself is picked clean. I like to think I know how to eat stone fruit with little waste – corn on the cob too – but I can tell you I’ve never come anywhere near as clean as this job. Whoever ate this peach had a lot of practice or keen hunger and patience. This begged the next question of who ate the peach? My immediate thought is raccoon, but why wouldn’t it take the peach away to its raccoon lair? My second guess is that maybe my grandmother ate the peach, though hastily, and put the pit out to be picked over by birds. I’m embarrassed to write this now, as this makes my grandmother seem a little nutty, perhaps, but it does seem like something she would do. She fills plastic bowls with water for birds. She scatters seeds across the railing in winter. I just thought perhaps she did the same with peach pits not picked perfectly clean. Later that morning I ask her if she’d left a peach out on the railing. Well, I say, it’s not there anymore. Oh? she says, looking anyway. Yes, just the pit is left, I say. I try to deliver this news somberly but my tone is more delighted. My grandmother clicks her tongue. Oh well, she says. I put it out yesterday to get soft. I was going to give it to your girls. I picture them fighting over a lone peach, lunging at one another, hair and arms flailing. Only one of them likes stone fruit so this would probably never happen. What do you think got it? I ask. A squirrel? Do you think one could eat a whole peach? What about a raccoon? No, no raccoon. It was a squirrel, she says. I realize now a two-foot peach slime trail better fits the profile of a smaller animal unable to carry or even necessarily drag a sizeable piece of fruit to its lair. Squirrels are also known to (over)stuff things into their cheeks. My grandmother is probably right. She should also probably get that broken chair (or chairs) fixed or maybe not.